Do you like honey? Did you chew honeycomb when you were a kid? Put it on your cereal instead of sugar? Honey is not only the world’s oldest sweetener, it’s one of nature’s perfect foods. Honey has been used as a medicine for at least ten thousand years — probably longer. Rock paintings show cave women harvesting honey from wild bees. It’s used all over the world in cooking, medicine and as a religious sacramental. Honey is made when bees collect nectar from flowers. As they take the nectar into their mouths it mixes with their saliva, which contains enzymes that begin the transformation process from nectar into honey. The bees then store the nectar in their bodies where it is digested several times — a little like cows chewing their cud — before being stored in honeycombs. As the bees fan their wings over the honeycombs, the water in the honey is evaporated, and the bees then seal the comb with wax. A good beekeeper encourages bees to overproduce so that a honey harvest will not leave them stranded with insufficient honey for their own needs. In Ayurveda honey has a positive effect on each of the three elements. Traditional Chinese medicine values honey for its nutritive and cleansing properties. It’s good for the spleen. Some consider it a yin (cool, damp) food, while others see it as balanced between yin and yang. In the West honey is traditionally used to relieve coughs and sore throats. Eat spoonsful of honey or chew honeycomb when you have diarrhea to help rehydrate your body. Make ginger tea and add honey to settle an upset stomach. 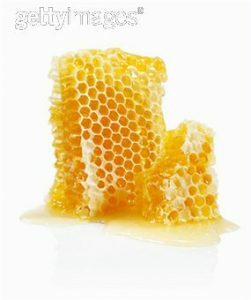 Honey can be applied to cuts, scrapes and burns. It is loaded with antioxidants and is being investigated as a possible cancer cure. It is the only known source of pinocembrin, an antibacterial and antimicrobial flavonoid. Doctors are using pinocembrin to develop a salve to stop MRSA. Honey is extremely easy to digest. It has no fat or cholesterol. It contains iron, calcium, magnesium, manganese — good for nursing moms — and potassium. Dark colored honey has more of these. Always use honey to sweeten tea, especially herbal medicinal tea. If honey crystallizes, don’t reheat it in the microwave. Boil water on the stove and place the container in it. Look for raw honey that has been strained but not heated or pasteurized. These processes kill off enzymes and other beneficial properties. Real raw honey is solid at room temperature, like coconut oil in its jar. It will have a spreadable consistency like jam. And it is brown, not TV-commercial golden. Even better, look for honeycomb — fresh raw honey as the bees have stored it. Put it in a bowl and press the honey out with a spoon. Cut off bits and eat it, wax and all. You can chew the wax like gum — this reportedly helps ear congestion — or you can swallow it. Or save the wax and make candles. Beeswax candles burn beautifully and have an ethereal, soothing scent. Do you want your own personal source of honey? Lots of people today have one or two bee hives, even in large cities. Look up “urban beekeeping”. Check with your city and county to see if beekeeping is allowed and what the rules are. Some diabetics can have small amounts of honey. Ask your doctor about this. Some doctors think honey may help to control blood sugar and improve insulin sensitivity. It has a slightly lower glycemic index than the refined sugars used in processed foods, but it is an invert fructose sugar and you may be told to avoid it. Honey is supposed to be good for seasonal allergies because it contains tiny bits of the pollen from the plants you’re allergic to. But some people have allergic reactions to honey, especially if they are allergic to bee stings. Take a little at a time paying attention to how you feel. Honey allergy usually feels like hay fever — runny nose, breaking out in hives, itchy eyes and sneezing. Over-the-counter antihistamines help in most cases. If you feel faint or have shortness of breath go to the ER immediately.